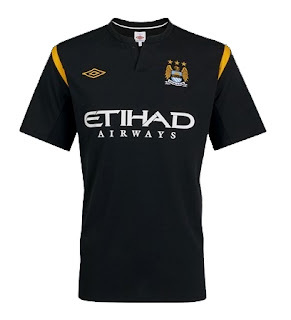 We're pleased to present the Official Umbro Manchester City 09/10 Away Soccer Jersey! A tribute to Manchester & the Bee. If you're like me, then you're probably wondering what exactly the Manchester Bee is. The kit designers spoke of the away kit as being partly inspired by the Manchester Bee’s industrious connotations and color symbolism: power, strength and confidence. It was said the away kit needed to look both bold and imposing; and therefore, chose to use the gold from the crest and on the shoulders to focus the upper body to open up the chest and define the upper torso. The rest of the kit is completely black, which creates a completely different personality to the home shirt but both honor the club’s heritage. The bee is not playing on the fact of danger, it is a symbol of Manchester's industrial past, representing the bee hive and worker bee analogy from the industrial revolution, and an integral part of the Manchester's coat of arms. There's a one pictured on a can of Boddingtons, the "Cream of Manchester".